Art lovers who are confused by the utter diversity and seeming directionlessness of contemporary art are looking to the future in the wrong place. Neither content nor form is the crux of the next art movement, but rather access and understanding. This is the infrastructure that ties Benjamin to Beuys, and moves beyond conceptualism and irony. Walter Benjamin wrote in the first half of the last century that mechanical reproduction reverses the function of art, and "instead of being based on ritual, it begins to be based on another practice—politics." In the second half of that century, Joseph Beuys saw multiples as key to spreading his ideas about social sculpture, or "how we mold and shape the world in which we live." Beuys saw physical reproduction as key to the dissemination of his art, even if evolutionary social processes are the core materials and fundamentally "everyone is an artist." The growth of conceptual art itself was in no small measure tied to strategic publicity and promotion (as was Impressionism in the Nineteenth Century and most other maverick artistic endeavors). The future of art ties new media to old, imbedded with concept, but its growth and coherence depends on systems of reproduction and access. In his small book on modern art, Behind the Times, the economic and social historian Eric Hobsbawm laments the failure of visual artists—unlike their counterparts in literature, music, and theater—to come to terms with the technologies of infinite reproduction. Hobsbawm extends the argument he made in his sweeping historical synthesis, The Age of Extremes, that modernism died around 1950 with the rise of popular entertainment. As fine artists cling to unique hand-made objects, the avant garde is beholden "to a society of patronage or of small groups competing in conspicuous expenditure, and indeed these are still the foundation of the really lucrative art trade. But it is profoundly unsuited to an economy which relies on the demand not of single individuals or a few dozens or scores, but of thousands or even millions; in short, to the mass economy of this century." While Hobsbawm puts his finger on the weakness of contemporary art as a social venture, he undervalues how crucial is the particular physicality of aesthetic experience. A digital renaissance in visual art must invent that connection: highly reproduced accessibility for personal physical engagement with art. The point is worth repeating: reproduction is the mass entry point for artistic experience. Arthur Danto, for example (who dates the "end of art" a decade-and-a-half after Hobsbawm does), recalls how a chance war-time exposure to a poster of La Vie, Picasso's blue-period masterpiece, gave a young solder in the Italian campaign the determination to see the original. Decades later, this now-famous art critic credits his "entire involvement with painting" with that accidental encounter with a reproduction, far from the sheltered galleries of a museum authenticity. In national polls, 96% of Americans say they are greatly inspired or moved by art, but only 27% say artists contribute "a lot" to society. This dichotomy captures the fundamental failure of contemporary art in America. Dependent financially on a market focused on the wealthiest elite buyers, art making has lost touch with the significance of public appreciation and understanding. The political import of social sculpture barely makes a peep outside of art schools, white cubes, and the occasional metropolitan public art curiosity. Popular tastes are regularly ridiculed and demeaned. Art education is removed from public schools. Cutting edge means esoteric. User-friendly explanations defy minimalist "in-the-know" exhibition standards. Arts funding is a sitting duck in partisan culture wars. The bottom line: artists cannot make a living, in a self-fulfilling mythical prophecy rooted in twisted biblical moral aspirations. The dominant counter-culture ethos of contemporary art starves its own practitioners and robs the greater public of a broader understanding of the values of art making in our daily lives. The combination of appreciation-oriented collector demand and anti-establishment artistic supply has reduced the visual arts to a minor appendage to the massive arts and entertainment industry. Visual artists are at the "super-creative core" of America's post-industrial economy as described by Richard Florida in his influential 2002 book The Rise of the Creative Class. Yet rather than commanding the avant garde of the 38-million strong "creative class," artists are instead leading only themselves further and further from the mainstream. Moving so fast to satisfy the cult of innovation, rarely do contemporary artists stop to explain their work in ways that relate to the lives of millions of fellow creative professionals, let alone the public at large, engendering a new kind of class divide that alienates artists from their broader community. Advanced degrees are now not only necessary to survive in the art world—with the MFA being the new industry standard—you also need one just to understand and appreciate much of the work being produced. The most obvious manifestations of this gap includes declining media coverage and declining funding from all sources for fine arts organizations and individual artists. As recently as the early 1990s, visual artists received 20% of federal arts grants to individuals, the same as their share of working artists in all disciplines. Today, visual artists receive absolutely nothing, nada, zip. Direct grants to all individual artists, moreover, are now less than 1% of the National Endowment for the Arts' budget. To working artists exhibiting in local venues outside of the glamorous art centers, it can often seem as though no one is interested in contemporary art. When culture wars flare, there is barely any public outcry. Moral crusaders freely act as though the arts defile family values rather than create them, examine them, and explore them at depths untouched by any other human activity, except, possibly, philosophical and religious contemplation—which, since even before the Diamond Sutra, have always relied on the visual, literary, and performing arts for their public expression. Many artists cringe at the thought of appealing to market demand, which is often seen as uninspiring, even ignorant, and pandering to a money-grubbing capitalist mentality unworthy of loftier artistic pursuits. Better to mock and critique mainstream currents of American culture than to fall prey to its superficiality or destructive imperialism. Irony is far safer for art-world credibility than selling out to the invisible hand. Mass-marketing art engagement can seem no more sophisticated than a newfangled coloring book, etch-a-sketch, paint-by-number, fuzzy wuzzy, or colorform, rather than like transformative social sculpture. Local artists and arts administrators often dread corporate approaches to art making, such as pre-fabricated stenciled tarps for large-scale public art projects. Yet, as Dave Hickey points out, "the language of pleasure and the language of justice are inextricably intertwined." And as McLuhan proclaimed advertising to be the last century's greatest art form, contemporary art had better internalize the seductive functions of corporate advertising if it wants to compete for the public's already-overwhelmed attention-span in the next century. The concepts of an ascendant creative class and economy indicate how the notion of social sculpture can operate on a societal scale. Contemporary art will never capture the public's imagination merely as art for arts sake. Nor will instrumentalist arguments ever convince the public to experience the transformative powers of aesthetic experience, no matter how many studies prove art is great for economic development, educational performance, and building moral values. Neither partisan politics nor financial gain will move art onto a larger platform of public appreciation, despite the most strongly held passions against war and enthusiasms for discovering under-valued talent. Art frames infinity. It is our closest contact with freedom. It is the miracle of creation in human form. It inspires us to live. Artistic creativity is essential to life, liberty, and the pursuit of happiness. These are among the most deeply held American values, yet somehow the intimate relation to artistic experience of such Jeffersonian aspirations has been lost in the public's eye. This is why reproduction is key to the future of art. Reproduction is necessary for renewability; without it, there's extinction. Reproduction is essential for visibility; without it, there's indifference. There are no limits to the growth of creativity—only a lack of advertising. Such growth is incremental and requires constant nurturing. Lack of accessible exposure, daily encounters, opportunities for engagement—that is what ultimately undermines public support for the arts: the lack of reproduction connecting to what audiences are ready to hear. Addressing this challenge requires more than clever tactics and innovative use of media. The task is far more complex than bloggers spreading funny but false rumors of Thomas Kinkade and Jeff Koons mergers acquiring rights to artworks by Maurizio Cattelan [PLATE 97] that will be merchandised on Glade® holiday candles [PLATE 98], along with Kinkade's own images. Rather, it means strategically rebuilding the contemporary visual arts market into a powerhouse that can compete with the giants of the multinational arts and entertainment industry. It means changing the way art insiders think about reproductions as product and reproduction as process. Looking back, this is why centuries of disciples—forgotten assistants and unquestioned geniuses alike—first experienced art by making copies. Looking forward, it means understanding the political economy of intricately contested markets for infinitely reproducible intellectual property in the digital age. 1. 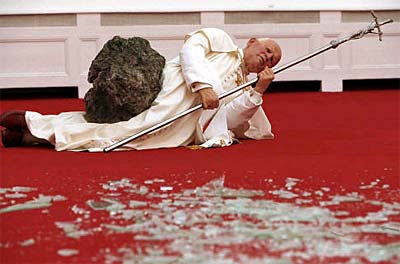 Maurizio Cattelan. La Nona Ora (The Ninth Hour). 1999. 2. 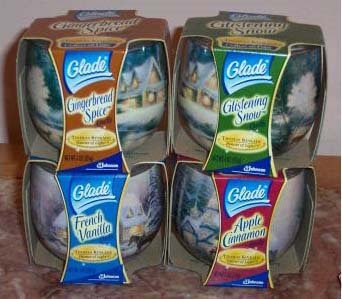 S.C. Johnson & Son Inc. Glade® Holiday Candles. 2004. Jackson et al. 2003; Princeton Survey Research Associates 2003. Szántó et al. 2004; Lowell 2004. Capps 2004; Coleman et al. 2004; Gibson 2004. Union for Radical Political Economics 2004.